Leo Super Store Created by leo-theme. This templates have specific characteristics, namely: Leo has features such as High Resolution: Yes, Compatible Browsers: IE8, IE9, IE10, IE11, Firefox, Safari, Opera, Chrome, Compatible With: Bootstrap 3.x, Software Version: PrestaShop 1.6.0.x, Columns: 2 . You can use this Leo Super Store on Ecommerce category for bag, clothes, cosmetic, fashion prestashop theme, hi tech, shoes prestashop theme and another uses. 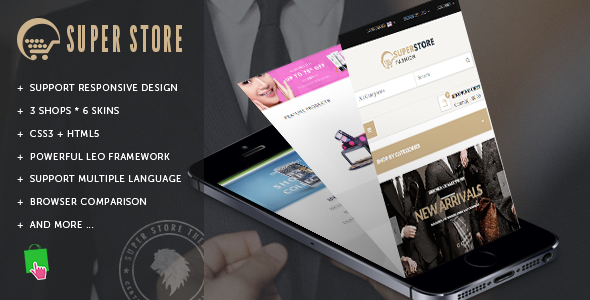 Leo Super Store is a prestashop responsive theme support multi store. If you are a merchant who is in business for lots of areas, Leo Super Store is the right choice because you can manage unlimited number of sub shops from the same back-office. Moreover, it have 3 different layouts which brings lots of choice for your shop.